The Kelly Criterion is often a hot topic of debate amongst bettors. Pinnacle has published numerous articles on the subject, from simple explanations to complex analyses. 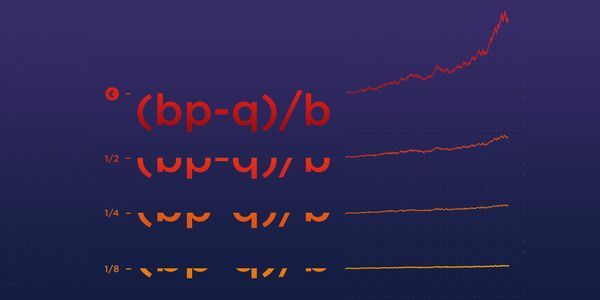 How does a fractional approach to the Kelly Criterion work and is it the best option for serious bettors? Read on to find out. In my article last month I revisited the Kelly Criterion as a means of money management. To recall, Kelly advocates staking in proportion to the probability of winning and your perceived advantage you hold over the bookmaker’s odds. Rather surprisingly, I found that Kelly was able to accommodate the risks of not knowing precisely your advantage so long as you are accurate on average. However, it was still clear that Joe Peta had a point when he wrote: “no matter what you calculate your expected return to be, your variance will be ridiculously… and… uninvestably high” in his analysis of the Kelly Criterion. In this follow up I investigate what we can do to reduce those variance risks and what impact that will have on expected profitability. It is frequently commented that a big problem with Kelly is that bankroll growth will be erratic, with profits interrupted by sometimes significant losses. In other words, the evolution of the bankroll is volatile. If we remind ourselves how a Kelly stake size is calculated (edge – 1 / odds – 1), sudden and large drawdowns will arise where a short price bet, which we believe holds significant positive expectation, loses. A Ligue 1 match from this month provides us with an example of the above. A rival bookmaker priced PSG at 1.35 to beat Caen, whilst Pinnacle had 1.20. After accounting for the margin, this implied an expected advantage of 11.5% (assuming the Pinnacle market is wisest) and a Kelly stake percentage of 32.8%. PSG’s match against Caen ended in a draw and nearly a third of a Kelly bankroll would have been wiped out in a single bet. Understandably, this is not the sort of drawdown that most bettors can tolerate, even if there are other opportunities available to grow the bank by a similar magnitude. For most people, even risk-seeking people, losses of this magnitude hurt significantly more than gains of a similar magnitude. In his book Thinking, Fast and Slow, Daniel Kahneman explains how with a simple thought experiment. In terms of absolute wealth, the outcomes for problems A and B are identical. If you choose the sure thing in either A or B you will end up with $1,500 (in addition to your existing wealth). If you choose to gamble, you will end up with either $2,000 or $1,000, depending on the outcome. Which did you choose? When Kahneman and his colleague Amos Tversky experimented with this teaser they found that the majority of respondents preferred risk aversion (and took the sure thing) when faced with the gain in A and risk seeking (and took the gamble) when faced with a loss in B. Equivalent statements of the same decision-making problem should yield identical choices. Since in this example they don’t, respondents were obviously not behaving rationally. The explanation is that problems A and B have different starting or reference points. In A it was existing wealth + $1,000; in B it was existing wealth + $2,000. Kahneman proposes that, since few of us pay much attention to these reference points, our attitudes to gains and losses are not derived from our evaluation of absolute states of wealth, but rather relative ones. And in terms of the utility of gains and losses, we dislike losing more than we like winning. Would you accept a fair even-money bet that could grow your bankroll by a third if it won, but shrink it by a third if it lost? If you wouldn’t, like I suspect most of us, then you are demonstrating loss aversion. How high would the win probability have to be before you’d consider changing your mind? 60%? 70%? 95%? Higher? From an evolutionary perceptive, it’s unsurprising that losses motivate us more the gains. As Kahneman has explained, living things that evaluate threats more urgently than opportunities have a better chance of surviving and reproducing. Since we represent the winners in the line of evolution (we are here after all), it necessarily implies that loss aversion is a preferentially selected adaptation according to natural selection. Via evolution our neural circuits have become finely tuned to detect relative changes in stimuli rather than absolute values. You can confirm this yourself using three glasses of water, one hot, one cold and the other with a temperature in between. For a minute or so, leave your left hand in the hot glass and your right hand in the cold, before immersing both simultaneously into the one in between. Despite both hands experiencing the same absolute temperature, your left hand will feel colder and your right hand warmer, by virtue of the different reference points each hand started at. If our predisposition to loss aversion necessarily makes the volatility risks associated with full Kelly staking uninvestably high, the obvious solution is to reduce the size of the Kelly stakes. But exactly how will influence the expected profitability of this money management strategy? 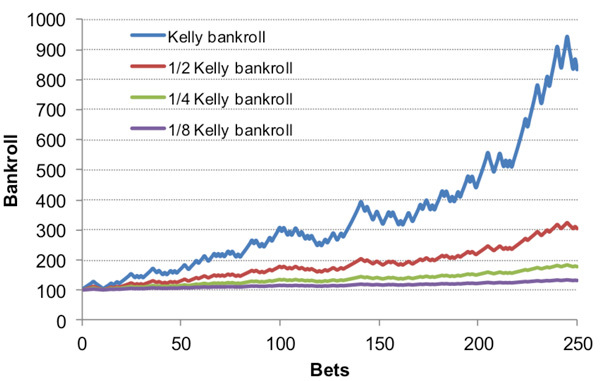 Numerous sources suggest that by halving the Kelly stake sizes the bettor can significantly reduce the volatility in the evolution of the bankroll yet maintain most of the expected returns. Let’s run some simulations to find out if that’s correct. Following the same series of 250 even-money wagers where the bettor holds a 4% advantage (expected win percentage 52%) the first chart below shows an example of one simulation. Four staking plans are compared: full-Kelly, half-Kelly, quarter-Kelly and eighth-Kelly. If a fully Kelly stake was 8%, then the half-, quarter- and eighth-Kelly stakes would be 4%, 2% and 1% respectively. 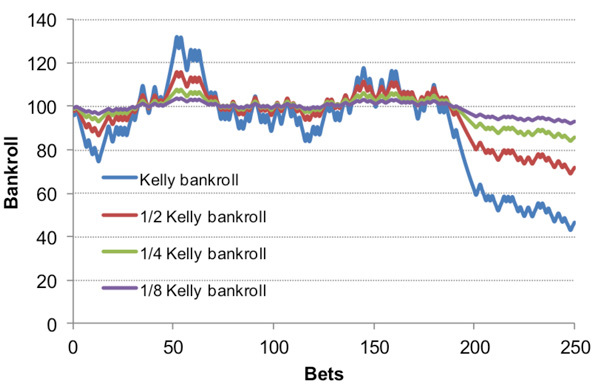 Unsurprisingly, the volatility or variance in the evolution of the bankroll is greatest for full-Kelly and least for eighth-Kelly. The next chart also illustrates that when our performance is luckier than expected, full-Kelly will perform much better relatively speaking than its fractional counterparts. But equally, when we are unlucky, full-Kelly will face much greater losses. The third chart below shows a series of 10 sequential losses which reduced the bankroll by 30%. For eight-Kelly staking, this was only 3.75%. As already explained, those sorts of losses are particularly unpalatable to most bettors, despite the greater rewards on offer from full-Kelly. But these are just three possible histories for an even-money bettor holding a 4% advantage. We need to run another Monte Carlo simulation to determine what to expect on average. I ran another 10,000-run Monte Carlo simulation comparing the four fractional Kelly plans for their likelihood of finishing with less than you started with. Remember, we found that about 14% of histories finished with less than 60% of the starting bankroll, confirming Joe Peta’s original criticism of the strategy. In this new simulation, this result was replicated within the bounds of chance. The full set of probabilities is shown in the table below. Whilst reducing your Kelly stake sizes doesn’t significantly influence the probability of failing to show some sort of profit after 250 even-money wagers, it does protect against significantly bigger losses over and above 20%. Halving Kelly stakes halves the probability of losing 20% of your bankroll. Halving the stakes again reduces it almost to zero. For losses of 40%, the risk reduction is even more significant. But at what cost to expected profitability? The next table shows the mean and median bankrolls after 250 wagers for each of the four strategies. Whilst the mean expected profit for half-Kelly is significantly lower than for full-Kelly, the median expectation is only about one-quarter reduced. Remember that since proportional staking plans skew the expected mean profitability on account of a few very large finishing bankrolls, the median arguably provides a better measure of what one should typically expect to happen. A median of 116 for example implies that about 50% of finishing bankrolls will be less than or equal to 116 and about 50% more than 116. It would appear, then, that reducing the risks by halving Kelly stakes (or more) is a price worth paying. The final table shows the results from a second Monte Carlo simulation where the bettor holds an 8% advantage (54% win probability). The conclusions are broadly similar: one can reduce the risks of failure significantly by giving up only a small proportion of expected (median) profitability. 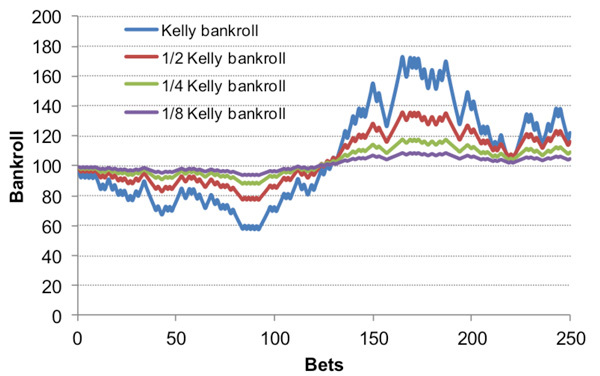 Is a fractional version of the Kelly Criterion the best staking method? Fractional Kelly appears to offer the bettor a solution to the volatility risks associated with full Kelly without giving up too much of the advantage that the Kelly strategy offers over fixed staking. For those averse to large losses, that will hopefully come as welcome news. Of course, as always, the much tougher battle is to be sure you hold the advantage over the published odds; believing and knowing that you do is not the same thing. Do not let overconfidence in that respect fool you.